Brain tumors are abnormal growths of cells located in the brain or arising from the coverings of the brain. Tumors are generally separated into two categories: 1) primary brain tumors (those arriving within the head itself) or 2) metastatic tumors (tumors that spread from different areas of the body). Primary brain tumors are differentiated based on the cell type from which they originate, including glial cells (cells that separate and support the central nervous system called astrocytes, oligodendrocytes, and ependymal cells), neuronal cells (nerve cells themselves), meningeal cells (cells that line the CNS), or Schwann cells (cells that line peripheral nerves ). Most primary brain tumors, specifically astrocytomas, are then further classified in a four-stage grading system based on World Health Organization (WHO) criteria. Grading ranges from I (benign and surgically curable) to IV (malignant). Currently, it is unclear as to why brain tumors occur. Although multiple large epidemiologic studies have been undertaken, no specific risk factors for tumor have been elucidated. The risk certainly increases with age, but otherwise, no specific environmental or genetic factor has been linked to most of these tumors. The exception is prior therapeutic radiation, which has been shown to increase the risk of glioma and meningioma formation. Primary brain tumors are diagnosed in about 17,000 patients every year of which 3,500 are in children under the age of 20. Metastatic tumors are much more common and are found in up 400,000 patients per year. All metastatic tumors are considered malignant, and the behavior of these tumors varies widely according to the type of tumor from which they arose. The most common types of metastatic tumors in order of frequency are 1) lung cancer, 2) breast cancer, 3) renal cell cancer, 4) melanoma, and 5) colon cancer. There are many types of CNS tumors and some of the more common ones are discussed below. Astrocytomas arise from astrocytes, which line and support the CNS. These tumors vary in grade depending on their histologic features (determined by a pathologist who looks at the cells under a microscope). Low-grade astrocytomas represent 15% of primary tumors and tend to occur in patients in their 30’s and 40’s. Treatment involves surgical excision whenever possible. The 10-year survival for low-grade astrocytomas is around 50%. The most common and most malignant type of astrocytoma is the grade IV astrocytoma or Glioblastoma Multiforme. GBM’s represent 25% of primary tumors and are the most commonly diagnosed tumors in those aged 55 to 75. Standard therapy involves a resection or biopsy, followed by a combination of radiation and chemotherapy (oral Temozolomide (Temodar)). Average survival for these patients is about 14-18 months. These tumors arise from oligodendrocytes, cells that produce myelin (the covering of nerve cell processes) in the CNS. Oligodendrogliomas account for 15-20% of primary tumors, and occur in two peaks, around the ages of 35 and 55. Survival is slightly better than astrocytomas. A test for “1p-19q chromosomal co-deletion” is a test that can be done on the chromosomes within tumors of oligodendroglioma origin. On average, oligodendroglioma tumors with 1p-19q co-deletions tend to have a better response to therapy (radiation or chemotherapy) as well as a better overall outcome, regardless of treatment. Ependymomas arise from the ependymal cells, which line the spinal fluid cavities inside the brain and spinal cord. These tumors occur in adults and children and account for 2.5% of adult tumors. The 5-year survival for these tumors ranges from 40-60%. Standard therapy involves resection and may include radiation and/or chemotherapy. Meningiomas arise from arachnoid cap cells along the dura (leathery covering over the brain and spinal cord). Meningiomas account for 25% of primary tumors and an increase in incidence with age. The vast majority of these tumors are benign and are curable with surgical resection. A significant number of these are treated successfully with radiosurgery. Standard therapy involves resection, radiosurgery, or fractionated radiation. In addition, medical therapies, such as chemotherapies and/or other medical therapies, are options for some patients. Epidermoids usually occur in the posterior fossa and are benign lesions which form keratin. Dermoids are found in the midline of the CNS, and may be associated with some form of the dermal sinus (small connection to the skin) and include skin elements such as hair, sweat glands, and oil glands. Both of these types of tumors are curable with surgical resection. Schwannomas arise from Schwann cells, which make the myelin that covers the peripheral nerve, and account for 8-10% of primary tumors. The most common location for Schwannomas is on the eighth cranial nerve (Vestibular Schwannoma), while the next most common is on the fifth nerve. These tumors are almost always benign and can be cured with surgical removal. Radiosurgery can successfully treat these lesions when they are small in size. Symptoms of brain tumors depend on the location of the lesion but can include headaches, seizures, weakness or numbness on one side of the body, speech problems, or problems related to cranial nerves (including facial movement, hearing, vision, or swallowing). Symptoms are usually slow and progressive in nature. 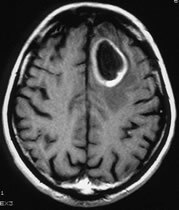 The diagnosis of a brain tumor is usually made using MR (magnetic resonance) imaging with and without contrast (image above shows a large ring enhancing tumor). Decisions for treatment of brain tumors are made in a formal conference called the Brain Tumor Board. Surgeons, pathologists, and medical and radiation oncologists discuss each specific tumor and formulate a treatment strategy. Treatment for primary brain tumors and metastatic tumors may include surgery, radiation, and chemotherapy. The mainstay of this treatment is surgical resection whenever possible, depending on the size and location of the tumor. Surgery involves an incision on the scalp, removal of bone over the area of tumor (craniotomy), and removal of the tumor. Most patients remain in the hospital for 2-3 days after surgery. Tumors such as astrocytoma, GBM, oligodendroglioma, ependymoma, medulloblastoma, are infiltrative, and thus even with the removal of all visualized tumor, the microscopic disease will remain. Fractionated radiation therapy, with or without a clinical trial, may be used after surgery to address any remaining disease. Radiosurgery is another treatment option, most often for benign lesions (meningioma, schwannoma) or metastatic tumors. This technique allows for a very high one time dose of radiation to be delivered to the tumor while sparing surrounding brain structures. This treatment is only acceptable for lesions that are less than 3cm in diameter, separate from the brain, and easily delineated on MRI or CT imaging. Metastatic tumors are slightly more circumscribed, but also tend to recur in the location of previous treatment or elsewhere in the brain. Surgery, radiosurgery, fractionated radiation, chemotherapy, and clinical trials are all options and often used in combination. Each patient and doctor should discuss what option(s) are ideal for each patient. Following brain tumor treatment, most patients will need serial follow-up, including exams and MR brain imaging to evaluate for recurrence or other long-term effects of the tumor or treatment. For information about clinical research being conducted at the University of Florida in the areas of treatment, education, support, prevention, and diagnosis, please our clinical trials web page.